Back in 2010, Kansas City sculptor Asheer Akram travelled to Pakistan to participate in a residency programme and to meet relatives. During his stay, the artist was introduced to the elaborately decorated cargo trucks that ferry goods across the country. The journey inspired him to shine a light on his often negatively portrayed culture, and add contemporary Pakistani motifs to his artwork. Soon after, the Pakistani Cargo Truck Initiative was born. Asheer Akram and the Pakistani cargo truck | Photograph by Rich Sugg. Both an art installation and mobile classroom, the Pakistani Cargo Truck Initiative is part of Akram’s bigger mission: through his art and public sculpture, he strives to create a dialogue about socio-cultural evolution and the effects of globalisation on developing nations. 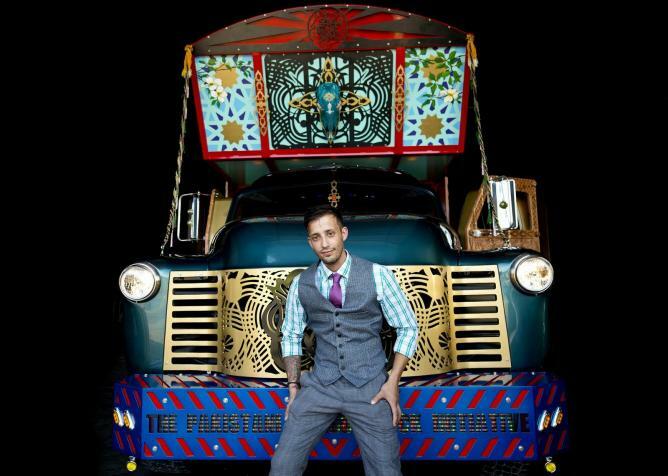 The truck is an American hybrid, built in the United States, using a dedicated team of artisans combining traditional Islamic and contemporary Pakistani motifs with American elements.